Sixteen Democratic U.S. Senators, including two with higher political aspirations, have joined Republican senators as co-sponsors of Senate legislation which might better be described as “the kill the Iranian nuclear pact” legislation. The legislation was presented to the Senate by Senators Mark Kirk (R-IL) and Robert Menendez (D-NJ), major AIPAC Senate leaders for their respective political parties.. The Senate bill, labeled the Nuclear Weapon Free Iran Act. would impose additional sanctions against Iran, thereby destroying the carefully negotiated nuclear pact Secretary of State John Kerry has worked out with Iran. On January 15, Chris Hayes devoted a segment of his MSNBC All In television program to a heated attack on the 16 Democratic senators who have turned away from President Obama and followed, instead, the marching orders of the Israel Lobby, led by AIPAC. Hayes is not alone in opposing “the kill the Iranian nuclear pact” Senate legislation. He provides media backing to California Democratic Senator Dianne Feinstein, (above left) who spoke on the Senate floor against the Kirk-Menendez legislation. 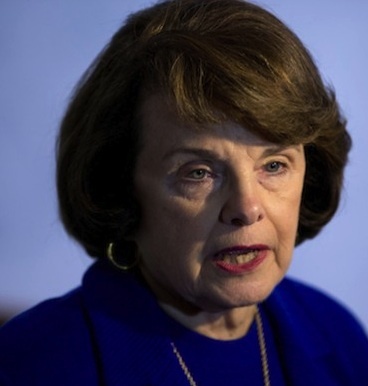 Senate Intelligence Committee Chairwoman Dianne Feinstein faced criticism Wednesday for comments that some thought implied a new Iran sanctions bill could put Israel in charge of U.S. foreign policy. “Candidly, in my view, it is a march toward war,” she said, echoing the White House argument that senators who support the Iran sanctions bill have a secret pro-war agenda. Feinstein took direct aim at a provision in the new bill that states, “If the Government of Israel is compelled to take military action in legitimate self-defense against Iran’s nuclear weapon program, the United States Government should stand with Israel and provide, in accordance with the law of the United States and the constitutional responsibility of Congress to authorize the use of military force, diplomatic, military, and economic support to the Government of Israel in its defense of its territory, people, and existence” Feinstein worried that this language might hamstring American foreign policy decision makers as a result. “While I recognize and share Israel’s concern, we cannot let Israel determine when and where the United States goes to war,” she said. Two of the sixteen Democrats supporting Kirk-Menendez, Senators Cory Booker, of New Jersey (right), and Kirsten Gillibrand, of New York (left), are widely assumed to be eyeing White House futures. In his MSNBC segment, Hayes recalls the recent history of two veteran Democratic senators who cast votes in the Senate in favor of invading Iraq. The two, Hillary Clinton and John Kerry, must cringe today when they see themselves in the Hayes report. Both have done well in their post-senatorial careers, but so far, no White House. Booker and Gillibrand are in safe Democratic states, so their need for AIPAC’s largess and muscle is not as crucial as it could be for their 14 pro-AIPAC fellow Democrats, most of whom are in states that lean toward the Republican political brand. With the United States and Iran about to embark on a critical phase of nuclear talks, President Obama is waging an intense rear-guard action to prevent Senate Democrats from supporting strict new sanctions that could upend his diplomatic efforts. Sponsors of the bill, which would aim to drive Iran’s oil exports down to zero, have secured the backing of 59 senators, putting them within striking distance of a two-thirds majority that could override Mr. Obama’s threatened veto. Republicans overwhelmingly support the bill. So far 16 Democrats have broken with the president, and the bill’s sponsors hope to get more. The Booker-Gillibrand duo can no doubt anticipate long careers in the senate. They present themselves as Progressive Democrats. Their early media coverage supports this belief. Booker, the 44-year-old Democratic former mayor of Newark, N.J., came into Congress as a rare freshman senator with celebrity status. He has been dubbed a rock star mayor by Oprah Winfrey, been called a hero for pulling a neighbor out of her burning home in 2012 and hobnobbed with Matt Damon. New York Senator Kirsten Gillibrand is a smart, hardworking passionate public servant, who is focused on the difficult economic challenges that are facing New York and the country. Since joining the U.S. Senate, Kirsten has helped expand health insurance for millions of uninsured children, stood with President Obama to ensure America’s economic recovery, and secured billions of dollars to create jobs in New York and make sure New York taxpayers get their fair share. This move to stand with AIPAC and Israel in a matter of foreign policy, has turned Progressives against both Booker and Gillibrand. The New Republic is not happy with Booker’s position on Kirk-Menendez. This isn’t credible. First of all, the administration presumably has some idea of what’s best for its negotiating position, and it has been lobbying furiously against new sanctions. Second, the timing is suspect—these senators hurriedly drew up this bill only after the breakthrough in negotiations was announced. Third, Iranian Foreign Minister Javad Zarif himself said new sanctions would signal a lack of good faith that would kill any long-term agreement. No, this bill is an attempt to kill the Iran deal, whether Booker and company admit that or not. No other explanation makes half as much sense. Booker, Gillibrand and their 14 Democratic senate colleagues will soon have to decide whether to stand with AIPAC and support Israel’s desire to kill the Iranian nuclear deal, or will they stand with Obama. This entry was posted in Middle East, Middle East Politics, Netanyahu, Obama. Bookmark the permalink. We should leave Iran alone. They have never threatened us. They may have called us bad names, but they are entitled to their opinions. Israel is the greastest danger to mideast and world peace, it wants to dominate. It’s time we stood up for our own welfare. We should complain about Israel’s 200 nuclear bombs, not Iran’s efforts to ensure its own future. ( The Iranian ambassador to the UN (former) has stated that Israel threatened to wipe them off the Earth,and not the other way around. I have already written to these senators to tell them that they make me ashamed of having supported the Democratic Party as an institution. It really doesn’t matter how “progressive” they are if they are willing to put the foreign policy of the US at the service of another country. That used to be called treason. Jim: Very good reporting. It’s very sad that so many of our members of Congress feel this deep allegiance to Israel. At least, I fired off a letter to Mark Kirk telling him that I, as a Republican that supported him in his successful election to the United States Senate , was very sorry to see that he was one of the chief sponsors of the Nuclear Weapon Free Iran Act that would impose additional sanctions against Iran which I believe would destroy the carefully negotiated nuclear pact that Secretary of State John Kerry has worked out with Iran. I also wrote that while I recognize Israel’s concerns in this matter, I believe that we can never let another foreign power (Israel) determine when and where and if,. the United States goes to war. That in my opinion is precisely what his legislation does. I closed my letter and wrote that I am very disappointed with the legislation of which he was one of the chief sponsors and that I never would have expected this of him. If some Democrats and Republicans are driven by their desire for war, as is evident in supporting an alien Israeli-driven proposal in Congress, then it will be totally justified for us ordinary voters to demand that Kirk and Menendez’s children be the first to go to fight the war in Iran.